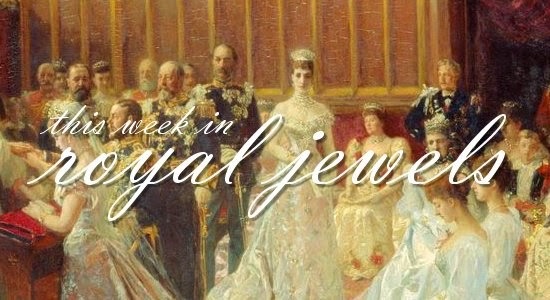 It was a light week for royal jewelry, but two bright, colorful pieces managed to steal the show. Be sure to vote for your favorites in the poll! 10. Princess Charlene of Monaco wore pearl stud earrings to accompany Prince Albert and Prince Jacques to the Sainte Devote Rugby Tournament on Saturday. 9. Queen Letizia of Spain chose glittering starburst-shaped drop earrings for the Rare Diseases World Day Event in Madrid on Thursday. 8. In Belgium, Queen Mathilde also chose what appears to be a lovely pair of drop earrings to visit a military hospital; unfortunately, her hair obscures their full shape/material in every picture I've found. Drat! 7. Crown Princess Mette-Marit of Norway wore a pendant necklace during a visit to Alna on Tuesday. 6. Queen Elizabeth II received credentials from new ambassadors on Wednesday wearing her usual daytime jewelry uniform: pearl and diamond studs, pearl necklace, and brooch. It's tough to see this one, but I think it might be the Pearl Trefoil. 5. Queen Mathilde wore a pair of colorful purple and red earrings to visit Turnhout on Friday. 3. Crown Prince Frederik and Crown Princess Mary of Denmark are on a visit to the Middle East this week. On Thursday in Qatar, Mary wore a lovely pair of pearl earrings. 2. At a Queen's Trust event in London on Thursday, Queen Elizabeth II wore her diamond and pink sapphire brooch. 1. My top vote of the week goes to Crown Princess Mary, who wore her Annikat earrings while in Qatar, The gorgeous earrings are set with large blue topazes bordered by diamonds and sapphires.